Dear Larry, hugs to you as you pass through your difficult times. A friend of ours is self-producing a CD and she has asked Anthony to perform a duet with her on one track. He is in the studio today which is why we can't see TP and Rod'z play. Next week we are booked and leave for Florida on Saturday morning so that's out also. We don't return until May 19th. Good heavens! This says I'm going to live to be 101 1/2 years old! I am about to review my presentation for Wednesday morning. It's all finished, it just needs a timing and I need to become more comfortable with the revisions. Since it's Powerpoint and I've printed out the notes pages I treat it as a script and a staged reading. I can't be off book (it's 120 pages of just me but some of the pages/slides are very short with one sentence to describe what's on screen) but I want to be comfortable enough that if I get a question during the slide show I can answer and then return to where I left off. There will be time after the presentation for questions but there may be questions during also. DR Elmore. MANY MANY HUGS TO YOU!!! If you're on a diet, find your favorite fresh fruit and splurge on it. Or there is always jello. It has few calories and always seems to cheer me up. Or go directly to RiffTrax.com[/ulr], where you can sample commentaries for.. I took a break from organizing my desk to read my horoscope. It said I should organize things today, lol. Back from a nap on the couch. DR Jrand's clock thingy says I'm going to live 'til 2048. If I'm serious about retiring in 20 months, guess I'd better think about a second career! ...And Crumbs Bakeshop happens to be around the corner from Levain too. CUPCAKES!!! Hmm, Jose's Upper West Side Bake Shop Tour? Friday or Saturday, June 29 or 30? I'm afraid to try DR JRand's DeathClock thingy. What if it says I should have died last November when I had a heart attack? I will shortly be hieing my way to New Jersey to my sister's house where the family is gathering to celebrate the birthdays of my niece and nephew. A fun time is guaranteed, but I really can't wait to catch the final episode of THE AMAZIN' RACE tonight. A book about a Lady Librarian Detective - Marion meets Agatha? I can't resist - I put both Real Murders and Dead Until Dark in my Amazon cart! 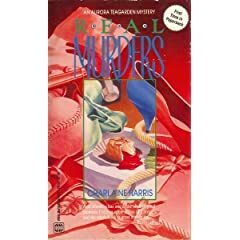 And I put Real Murders on my request list at the library! I'm up, I'm up, and have been doing stuff. I'm about to go into Ye Olde Garage and begin the task at hand. elmore, you want something exciting, give me a call. Off for my big afternoon plans - my first visit to our brand new Kroger Marketplace, right here in Middletown, OH, complete with Starbucks. Do I know how to have a good time or what? 1) The NY Post went up from 25 cents to 50 cents. -For some that's interesting, for some others, not so much. 2) The Ollie's in Times Square has shuttered. Apparently, the Carmine's next bought it out and will be expanding into the space. I came across a new Ollie's on 42nd between 9th and 10th, next to West Bank Cafe. I almost went to dinner the other night, but when I walked in, the place looked a bit smaller, a bit more fancy, and the prices were a little higher too. -Although, they have expanded their menu to include some more "real Chinese" items. I'm just wondering how they're going to be now that they're not off the main drag (Broadway). No more five minute walk to the theatre after a dinner there - unless you're heading across the street to Theatre Row or Playwrights Horizons. I guess we Hainsies and Kimlets will now have to find a new "good ole stand-by" place to eat in Times Square. Did you get any cookies today, Jose? I am very jealous....I want to go too!!! I don't think it's really a sign of anything since everyone born on the same day who is a nonsmoker and has about the same BMI will have the same date pop up. And I did it 3 times and got 3 different dates! The stomach meds seem to be working for Boo. She's eating and keeping it down which very much pleases me. Too bad about Ollies. I'm not a fan of Carmine's. The space is already cavernous and you can't hear someone if they are sitting next to you. It's not a place for conversation and two people can't eat there easily since it's a "family style" restaurant (meaning portions are based on groups of four or more). The new Junior's isn't bad except that sometimes it's very, very crowded. Another one bites the dust. The Death Clock says my personal day of death is June 4, 2023. Since it is a Sunday, at least I will already be at church. Oh, I like the lady librarian detective idea. DR GINNY, where are you? As of December 1, 2059 I will be no more. I hope you all can make the memorial service and I expect lots of flowers. Thank you.